Pattaya (พัทยา) is a popular resort on the North Gulf Coast of Eastern Thailand, 150 km south-east of Bangkok. In the Western conception Pattaya is most famous for its go-go and beer bars but besides the women on offer, the place has recently upgraded itself to be one of the best family locations in Thailand. Even though Pattaya hasn’t completely lost its ‘seedy’ side, it now attracts a huge amount of local Thai, North Asian and South Asian tourists who are just there with their families for a fun time. The local authorities-in-charge have, over the past few years, certainly improved the quality of the beaches but some of them are still lacklustre (by Thailand's high standards) and rampant over-development has long since destroyed some of the natural charms it once had, but its plethora of hotels and guest houses and convenient location with quick and easy access from the capital make it a popular weekend getaway. Catering for over 5 million tourists yearly, Pattaya is also able to offer an excellent range of eating choices and a wide variety of things to do and see. and its population is a colourful potpourri of mixed nationalities from near and far. The three kilometers long, main Pattaya Beach, runs along the city centre. The beach is full of life with hotels, restaurants, shopping malls all along the road facing the beach. The street along the beach – Walking Street – comes alive with rock music as the night sets in. People throng the street to experience the night life, which is unique in all respects. There are hundreds of beer bars, go-go bars, discotheques around the area. Muay Thai, the Thai Boxing, an open arena in some of the beer bars are exciting to the hilt. Another beach in Pattaya, Jomtien Beach, more popular among family vacationers, is on the Southern part of the city, and separated from the main Pattaya Bay by a hill. Jomtien is more calm and serene compared to the crowded Pattaya Beach and a paradise for water sports enthusiasts. Jomtien is also popular for its amusement park and tower, to keep children entertained. 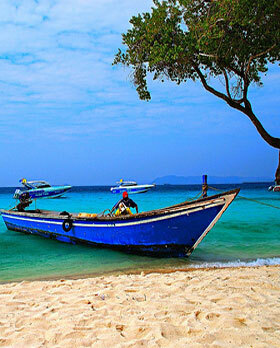 The one km long, Wong Phrachan Beach, situated on the Northern part of the Pattaya Beach is a favourite among swimmers. Pattaya's main beaches are popular and busy places. For the thrill-seekers, activities include banana-boat rides, jet-skiing, water-skiing, parasailing, windsurfing, and the like; and anyone who just wants to enjoy a simple swim or a good splash around with a frisbee or rented inner tube will always find themselves with plenty of company. However, while in and beyond the surf, a wary eye does need to be kept on the more frenetic elements of the passing traffic. For those more interested in inactivities there are acres of sand jam-packed with recliners and umbrellas (usually with an "in-house" supply of drinks), serviced by an army of laid-back but tenacious hawkers offering anything and everything from food (especially seafood, fruit, ice cream) to massage, manicure/pedicure, tattoos, lottery tickets, newspapers, herbs, flowers, gems, perfumes, sunglasses, CDs, watches, lighters, clothes, toys, souvenirs, handycrafts (it's a bit like TV shopping - as soon as you've declined one offer, it's time to consider another) and so on. Eventually you buy a very dark pair of sunglasses, and after that you just pretend to be asleep.